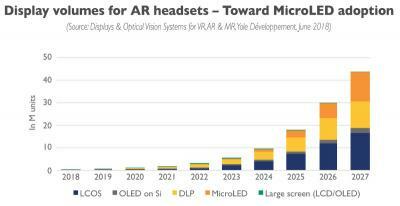 Yole Developpement sees the AR market finally emerging in 2022 or 2023 - as there are still several challenges to solve before AR systems that are good enough for mass adoption. Yole sees OLED microdisplays (OLED on Silicon) as the best current technology, but by 2022 it is likely that MicroLED displays will prove better than OLEDs - and so OLED shipments to the AR market will always be quite limited in volume. How to sovle the high manufacture cost of uLED seems an issue with no solution yet.